Lightweight, high-flow 200 cpsi catalyst link pipes adds an even more aggressive sound when used in conjunction with Akrapovic exhaust system. 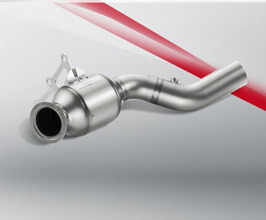 Remapping the ECU is required when installing Akrapovic aftermarket optional down pipes with sports catalytic converters or without catalytic converters, and were developed for track use only. THIS PRODUCT DOES NOT MEET EMISSION COMPLIANCE REQUIREMENTS FOR STREET OR HIGHWAY USE.